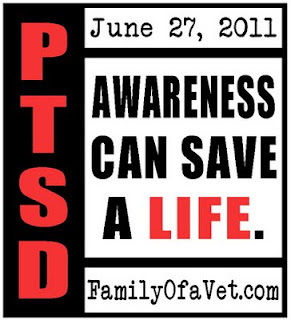 June 27, 2011, is National PTSD Awareness Day, a day intended to encourage awareness and education about post-traumatic stress disorder and help end the stigma associated with the disorder. The Veterans Administration, our nation’s largest provider of combat-related PTSD care, is an integral component in the fight against PTSD-related stigma… a stigma which contributes to the loss of 18 veterans each day to suicide, to the failing of 2 out of every 3 impacted marriages, and to hundreds of thousands of caregivers and family members who are now struggling with Secondary PTSD. However, as of 10:45 am CST on June 27th, the home page of the VA’s website (http://www.va.gov/), the VA’s blog (http://www.blogs.va.gov/VAntage/), and the VA’s main Facebook page (http://www.facebook.com/VeteransAffairs), give no mention of this critical day. In a society where the majority of veterans who have served in Iraq and Afghanistan (according to the VA’s own research - http://www.hsrd.research.va.gov/publications/forum/may11/may11-2.cfm) access the internet each and every day, this lack of coverage by the institution which is supposed to provide the majority of their PTSD-related care is an incredible oversight and one that further underlines and intensifies the stigma this day is supposed to fight against. 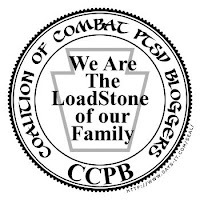 Family Of a Vet, is a non-profit organization dedicated to helping veterans and their families learn how to cope with PTSD (post-traumatic stress disorder), TBI (traumatic brain injury) and life after combat through real-world, plain language education and resources for heroes, families, and communities. 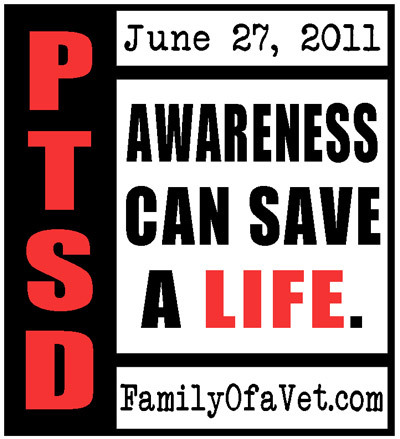 For more information about this topic or to schedule an interview, please contact Brannan Vines, President and Founder of Family Of a Vet, Inc., by e-mail at Brannan -at- FamilyOfaVet.com. Thank you.